By his estimation, he has stripped millions of wires over the years, and he has seen his fair share of wire strippers come and go. That cheap set of wire strippers you have with the graduated holes, or that adjustable stripper you squeeze as you pull the wire through? They just stress the insulation as well as the wires you are trying to strip – he says you might as well just use them in your tackle box. His favorite style of wire stripper is the automatic kind that grip the wire, then cut and remove the insulation just by squeezing the handles. His issue with this particular tool is that it’s difficult to get a uniform length of stripped wire when working in volume. Since [Alex] needs uniformity in his line of work, he modified a set of automatic wire strippers to include an adjustable wire stop. He determines the length of wire he needs, adds or removes some washers from his wire stop, and off he goes. It’s a very simple yet very useful hack, depending on your application. We bet it is probably one of the most accurate ways to get uniform length, this side of a fully automatic wire stripper. I have a Weidmüller stripper that alrady have an adjustable stop…. Or am I missing something here?? 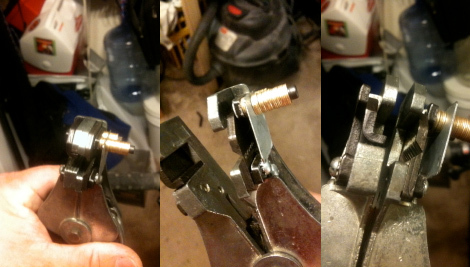 A while back I got these ultra cheap-o auto adjusting strippers that have worked surprisingly well. They have a length adjustment built in. Haha, I’m with you, captainbacon. Disappointed! Pretty sure I am not the only one thinking this article was gonna go a different route. Had a stack of $1 bills all ready too! Pretty nifty hack, but most come with an adjustable plastic stop. However, I do not use them. After enough repetition you develop an eye for it. First: A good Wire-Stripper is quite expensive. Second: Most automatic strippers dammage the insulation a bit, where they grip the wire. There are industries, where only non-damaging wire strippers are allowed. These look much like the one in the pictures. Speaking of strippers, did anybody else know that many stripper poles have bearings in them to enable angular rotation? I wonder what would happen if you installed thrust bearing instead? did not know that… time for some research! Everybody likes a good stripper. As we all know, angular rotation perpendicular to a shaft is best facilitated by a low friction surface. Preferably one with ball bearings. This video shows off the rotating effect quite nicely. She isn’t actually rotating herself (she can’t overcome that much friction anyway). The pole is rotating. Gotta nit-pick a little bit about this. Automatic wire strippers are nice and all but I wouldn’t throw the cheapies in the tackle box. I can’t be the only one who occasionally solders one end of a short jumper to a piece of proto-board then realizes that I forgot to strip the other end. Bulky auto-strippers won’t save you there. i just provide them with a little Methylbenzoylecgonine, and they do my bidding from that point on. Methyl (1R,2R,3S,5S)-3- (benzoyloxy)-8-methyl-8-azabicyclo[3.2.1] octane-2-carboxylate doesn’t work as well as methane trichloride, one would think. Haha, hacking strippers do your biting! The most simple way to unisolate thin wires is to use your teeth or your fingernails. strip them with my teeth reowl! Think model shown in the “hack” is American style. They came in my apprenticeship toolkit over 20 years ago, and I wouldn’t use anything else! Adjustable length, an adjuster for different thickness of shielding and even a cutter built in too. Even for casual use, these make cable stripping as easy as squeezing. “First: A good Wire-Stripper is quite expensive. And these hold true to the regular strippers as well. Stay away from the automatic ones, they cause a LOT of damage. +1 for the automatic ones causing damage. Anyone know where to buy the EXACT wire stripper this guy has? nice to see I’m not the only one. Teeth FTW! god damnit, i was expecting social engineering… fsck your misleading titles. How does that cope with PTFE insulation? And how do you cope with the fumes?